If you’ve ever turned up to a job and they explain that they’ve done a bit of research on the internet prior to calling in the professionals, you won’t be surprised to see the results of this study into the home maintenance queries most searched on Google. 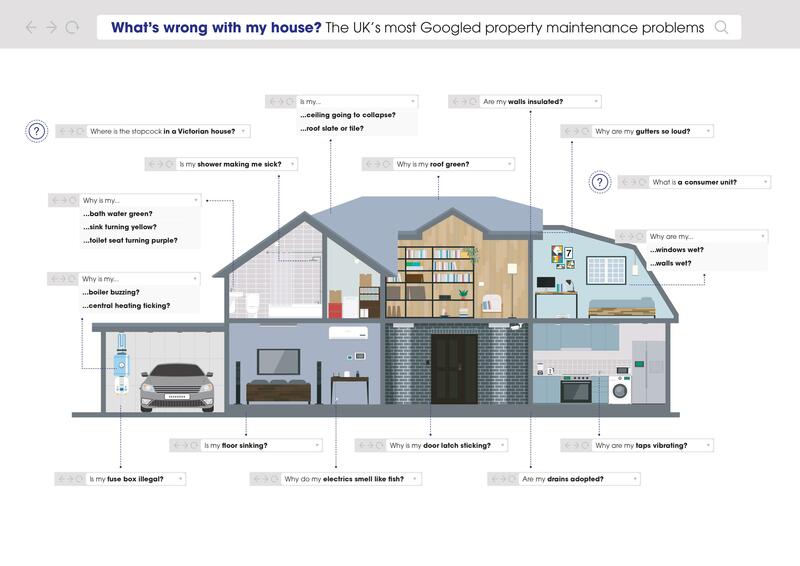 Experts at London home maintenance firm Aspect analysed Google search data from the past year to discover the issues that cause the most concern (and confusion) to UK residents. And although some might seem a little unusual, to put it mildly, these are worth bearing in mind when thinking about the content of your own website and how you might attract new potential customers. The research revealed that the type of concerns people have about their home depend a lot on the kind of property they live in. People living in smaller properties tended to be concerned with ongoing maintenance issues. The most commonly entered searches for people living in flats were “my flat is so cold”, “is my flat making me ill?” and “why is my flat so dusty?”. People living in apartments searched for “my apartment smells like onions”, “why is my apartment so cold?” and “is my apartment making me sick?”. Is my roof safe to walk on? Why are my walls wet? Why are my walls sticky? Is my floor going to collapse? Why are my electrics tripping? Why do my electrics smell of fish? Is my fuse box illegal? Why is my fuse box clicking? Why is my central heating ticking? Why are my taps vibrating? Why is my bath water green? Why are my drains gurgling? Why is my shower cold? Is my shower valve upside down? Is my toilet flange too high? Is my shower making me ill? Why is my toilet seat turning purple? Why is my sink turning yellow? Why is my door latch sticking? Why are my gutters dripping? Why are my gutters so loud? Why is my roof green? Have you been asked any bizarre questions by your customers? Let us know on probuildonline@gmail.com or by joining in the conversation on Twitter.